In this page I will journal my 10 days which begin on January 27th. I will be honest and candid about my thoughts and feelings, and will also share any new recipes I may try out during these detox… Keep your fingers crossed and hope that I come out of this in one piece! For breakfast on the go, at the grocery store, I had strawberry chia smoothy, made with apple juice, strawberrypuree and chia seeds. That’s it for the ingredients, pretty close to a home made smoothy. No additives, preservatives and such. Lunch today was scrumptious. This was a real win! So I had a cup of Ballela salad, which is a chickpea salad with a few black beans, onions, parsley tomatoes, garnished with garlic, olive oil and sea salt. I also had 2 large strawberries, 12-15 snap peas with a tahini sauce to dip, and 2 slices of Ezekiel cinnamon raisin toast with Almond butter. A glass of fresh tangerine juice on the side. I cheated on tea :-(. Oops, I had no decaf, so I had a cup of almond milk, with a spiced chai tea bag, dipped only for 30 seconds (just for the flavor) and 2 teaspoons of coconut palm sugar. Dinner was wonderful. A bowl of brown basmati rice, with lemon ginger rasam and on the side, sweet potato and peas curry and a spinach and lentil (kootu) side. For my night craving an apple sufficed. My judgement on today — Caffeine cheat, need to add meditation, exercise and more sleep. Most importantly need to up my intake of water. Today I remembered that I was on detox. That in itself is a step in the right direction. Began my day with a cup ofwarm water, with the juice of a lovely Meyer lemon. This was followed by a wonderful smoothy made with Almond milk, banana, pear, strawberries and chia seeds. This was quite a satisfying breakfast. 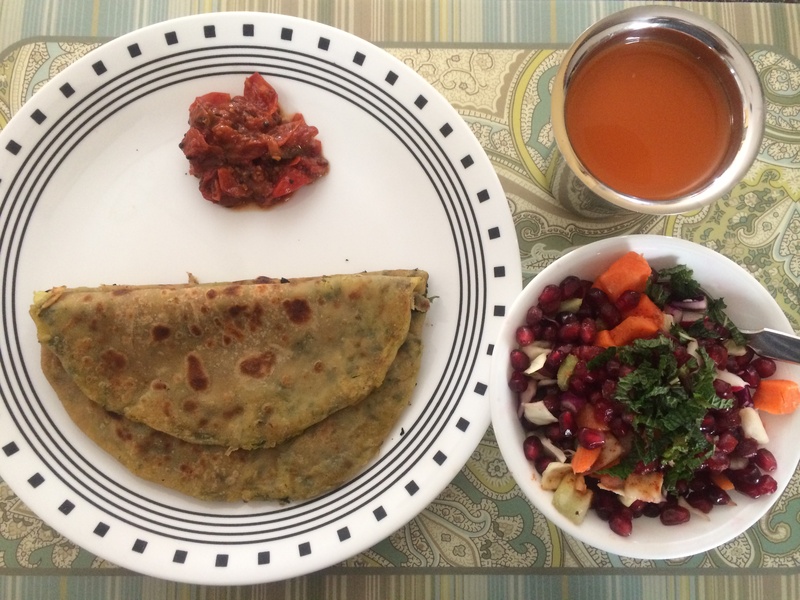 Lunch was wonderful, two aloo parathas (potato stuffed flat breads) with homemade tomato chutney. This was preceded by one of the most wonderful salads I have had. A cup of chopped vegetables (radish, green and purple cabbage, carrots and green bell peppers) with a cup of pomegranate seeds and chopped fresh mint, with a few drops of hot sauce. All this accompanied with a cup of fresh organic carrot juice. For teatime, I had a hot cup of almond milk with a teaspoon of coconut palm sugar and a bag of pure ginger tea. It was one of the most amazing drinks I have had. Dinner was a Adai, a south Indian crepe made with lentils and dals, very high in protein and very satisfying. this is usually eaten with jaggery sugar. On the side I had one avocado and one kumato tomato with freshly ground Himalayan pink salt and crushed red pepper. My judgement on today — Still had headaches and withdrawal through the evening, though the headache subsided by night time. The meals were wonderful and satisfying. Feeling the lack of caffeine. Craving a cold glass of milk. But I am going to bed feeling good! Woke up with an awful headache that got progressively worse. Tired, nausea, and shivering… Serious withdrawal symptoms today. Whoever knew one could get so addicted to caffeine. I got to fight this. To add to the tough day, was the fact that I was supposed to go gluten free. Today and tomorrow. Started the day with lemon water. Then had a smoothy made with coconut milk, chia seeds, strawberry andbanana for breakfast. 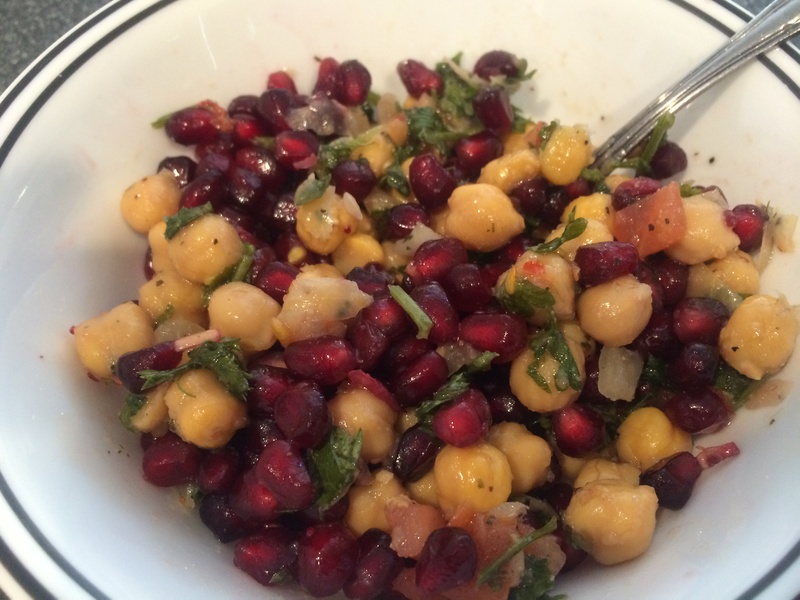 I also had a mid morning snack of chickpea salad with pomegranate, tomatoes, onions and parsley, with lemon and olive oil. Snacked on raw trek mix, with nuts and raisins. 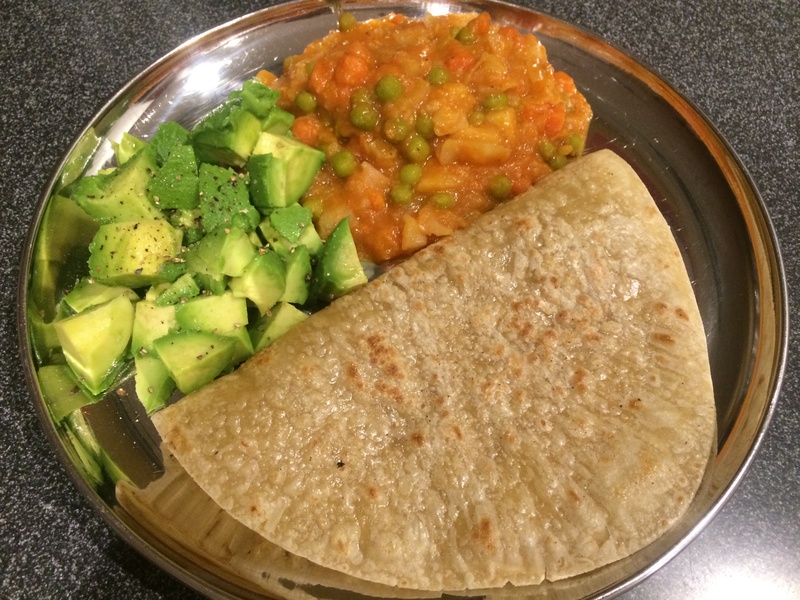 Dinner was yummy, a brown rice tortilla with a vegetable kurma and one avocado with sea salt and black pepper. Ended the day with a massive headache that continued through the day and pretty much got to a point where I could not do any other work. I skipped my pottery studio today and just crashed at 8.30pm…. My judgement on today- It was one of the toughest days for me. Had a very difficult time getting through it. Not sure if I could have done it without my husbands support and my cheerleader, Sneh Jaisingh of Nutriage. Started the day with some lemon water. Followed by a shake with coconut milk, banana, strawberry and hemp powder (2 scoops). I also started taking a kombucha drink today. A cold tea of sorts with probiotic, that is supposed to be really good for the GI system. The tea was fabulous, I restrained myself to about 5oz today. Another 5oz tomorrow. Lunch was a middle eastern spread. Home made, hummus, stuffed grape leaves, tabbouleh and a black bean salad, with kalamata olives. 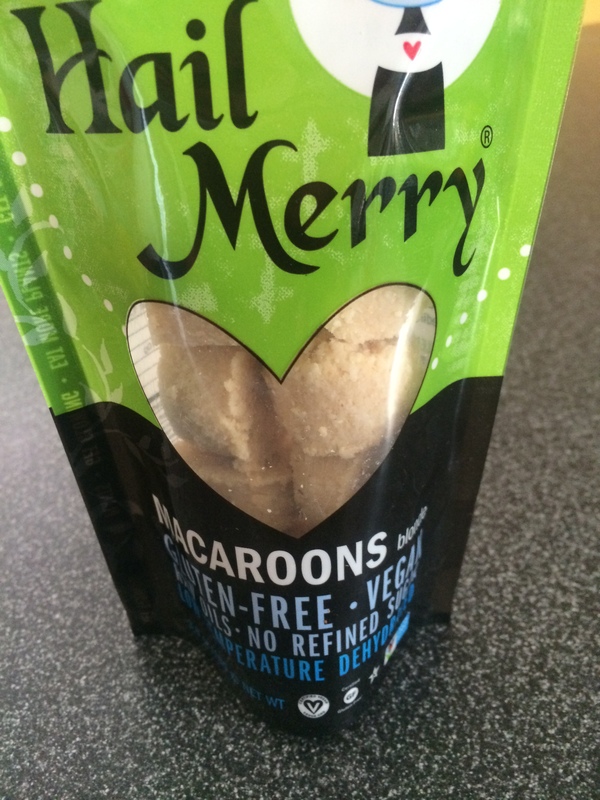 Snacked on some divine macaroons! Yup! 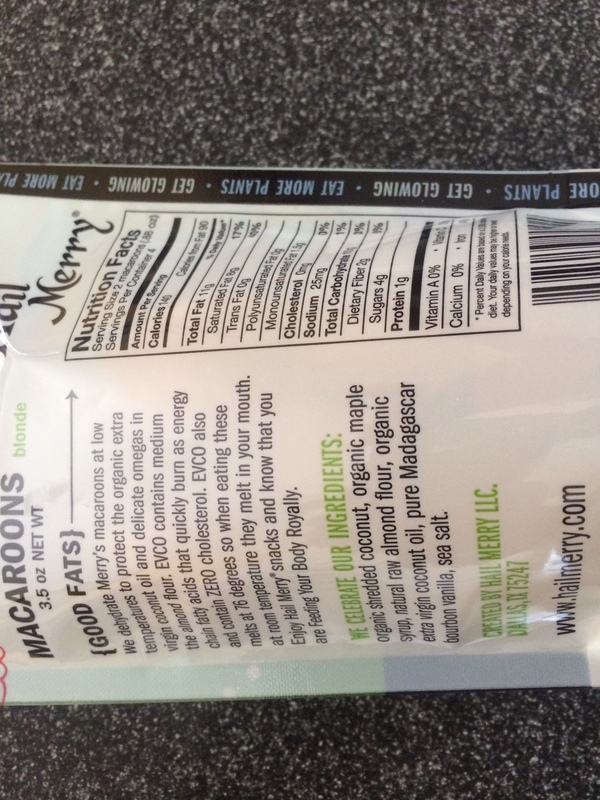 I went to Whole Foods in the morning and found this most wonderful macaroon product, that is raw, and has no additives or preservatives. It is wonderful, and I am pretty sure I will continue to buy it even after the detox. Dinner was fabulous. 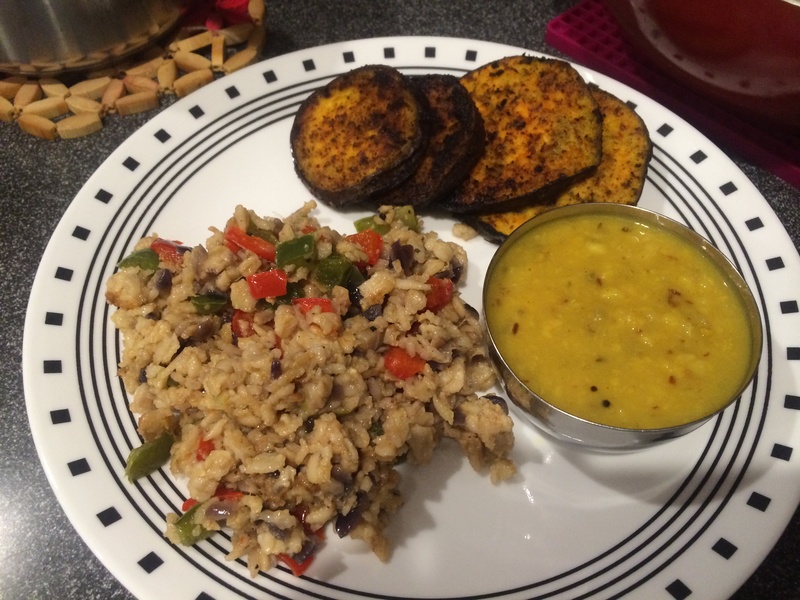 Oatmeal (fried rice style), pan fried eggplant slices, and moong dal. Very earthy and satisfying meal. I skipped a salad, since I am doing raw food day tomorrow, might as well, splurge on cooked food tonight, right?! Instead, I was a good girl and had fresh fruit for dessert. Raw Food Day! Sounds scarier than it is, but there is quite a bit one can eat, with just raw food. I started the day with lemon water, hot, followed by a smoothy. This one was made with orange juice, banana, kiwi, strawberries and chia seeds. Yummy! Lunch was a hearty Tabbouleh salad with soaked bulgur, not cooked. On the side was a tuscan melon, the juiciest sweetest, ones I have had, with a lemony tahini sauce dip. 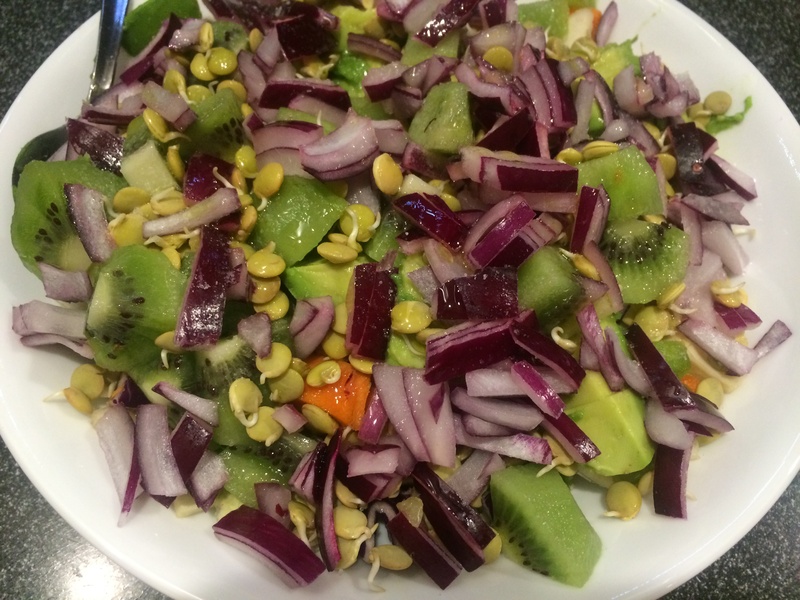 Dinner was another big salad, with chopped vegetables (green peppers, radishes, carrots, purple cabbage) with avocadoes, kiwis, and red onions. This was dressed with salt pepper and the juice of a fresh meyer lemon. Absolutely delicious!purple cabbage) with avocadoes, kiwis, and red onions. This was dressed with salt pepper and the juice of a fresh meyer lemon. Absolutely delicious! The thing with raw food diets is that they make you hungry frequently, and I find that the key is to snack healthy. I had a lot of freshly squeezed pink grapefruit juice, carrot juice and tangerine juice throughout the day. I also snacked on one of my all time favorite snacks, date nut balls, the most delicious goodies one could ever have. My judgement on today — I wish raw food day did not have to be on a Friday, Friday night was the toughest, not being able to do a fun meal and drinks with the family. A cup of Mexican hot chocolate actually sounded fab, but I resisted it. I am sure it will be well worth it! Did hot lemon water in them morning. Followed by my traditional Almond milk, strawberry banana with chia seeds smoothy. 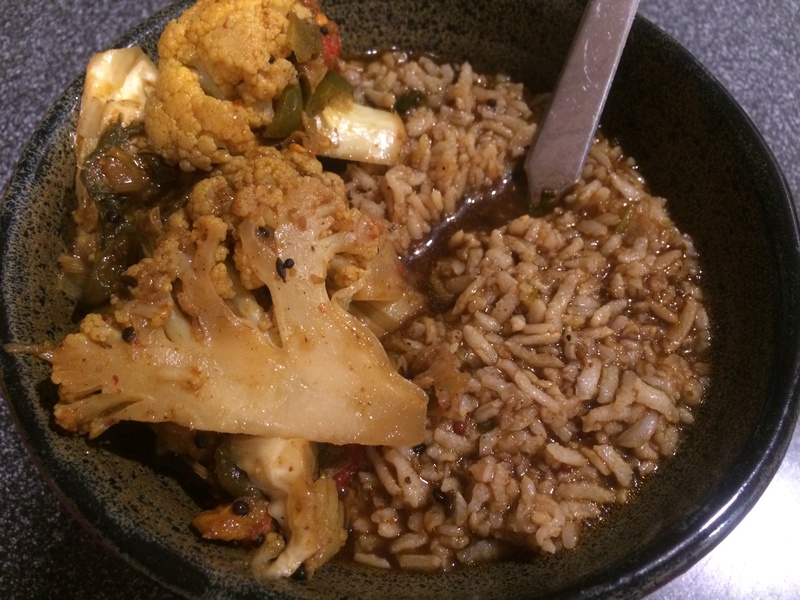 Lunch was easy with brown rice and oatmeal fried rice style, with a side of gotsu, a tamarind gravy simmered with onions and tomatoes, and a crispy and flavorful lentil and red pepper pappad on the side. The reason I went with the pappad was that it was homemade with no additives, preservatives and flavor enhancers. Delish! Dinner was cheese pizza for the whole family. 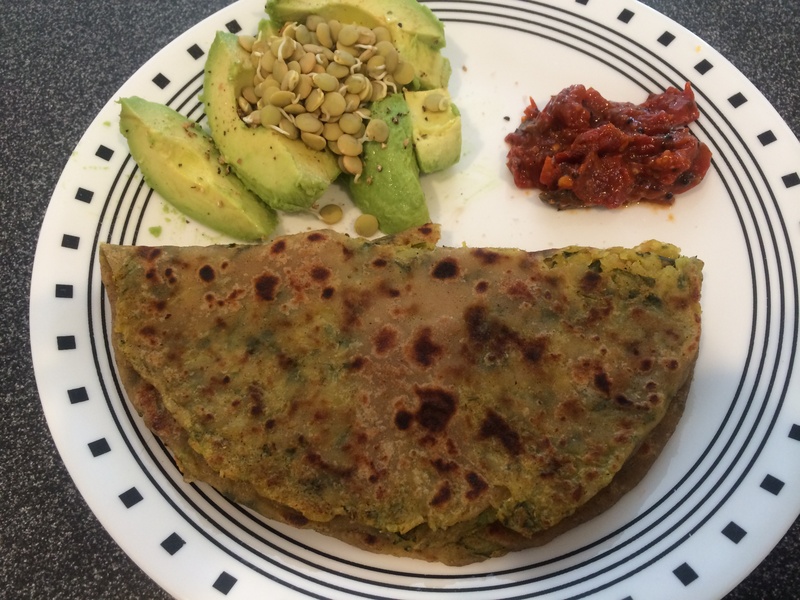 The house was smelling delicious, yet I resisted and went with homemade lentil crepes, with a side of homemade amla chutney and coconut chili powder. After dinner we cut the vegan carrot cake that I had gotten for my 5yo cutie pie! How do you say no when the cutest little 5yo you know says pretty please, you have tohave a piece of my birthday cake? You give in!!! Yes, I confess…. I had the teeniest slice, but it was well worth the lovely smile on my little dolls face! Hey atleast it was vegan and it was seriously a tiny piece, just 3-4 small bites thats it! My judgement on today: I am ready for a couple of rotis/chapathis/wheat flat breads! Yeah tomorrow shall come soon! Started the day as always with hot water, this time just plain old water, with no lemon. I made a coconut milk, hemp smoothy with banana and strawberry. Yum! Had a mid-morning snack of date nut balls and carrot juice. 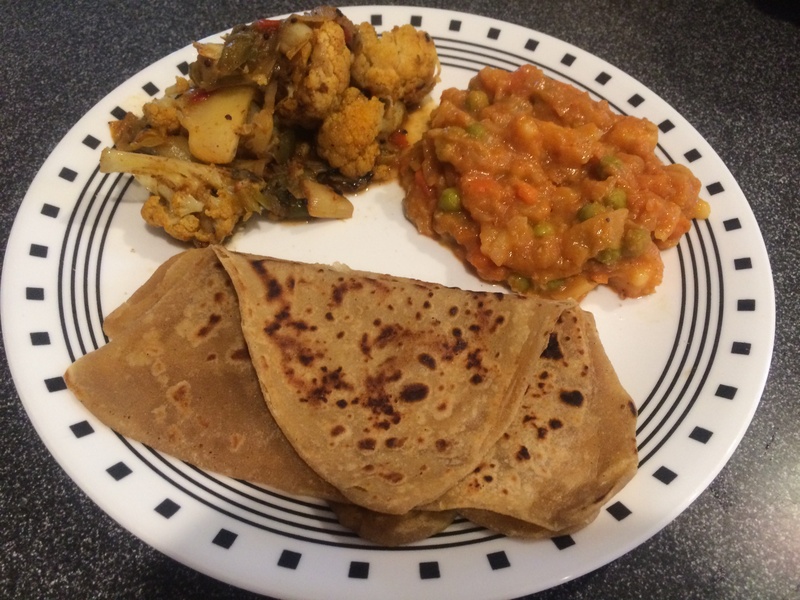 Lunch was roti’s with cauliflower curry made with leeks and peppers spiced with some Ras el Hanout and a potato korma, that was delish. Grapefruit juice fora a mid-afternoon snack. 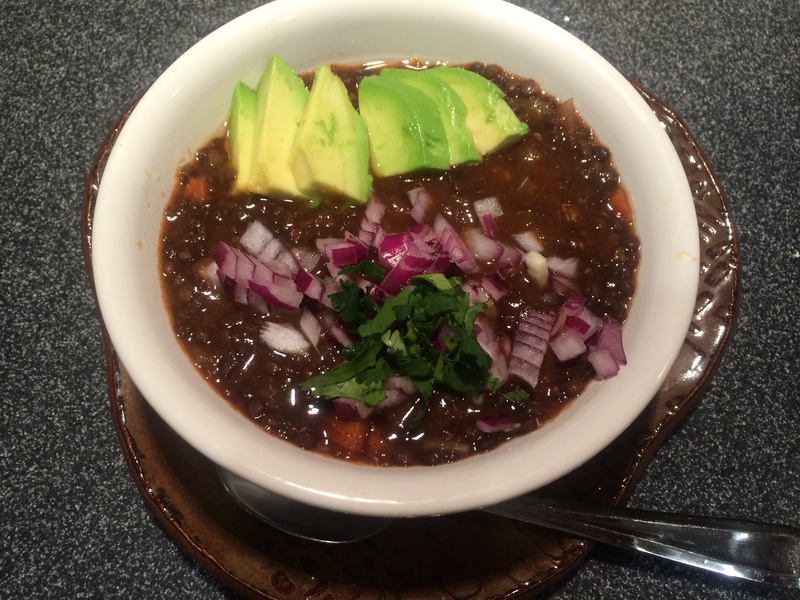 Dinner was the most wonderful black lentil soup. I have not cooked much with black lentils. Picked some up at Whole foods a couple of days ago and decided to try it out. They cook up really fast and very well and are extremely tasty. Even the kids loved it. We garnished it with slices of avocado and some chopped red onions and cilantro. Yummy! My judgement on today: It was a great day. I am actually looking forward to another gluten free day tomorrow, when I can have rice and a salad. I am actually smelling coffee the awesome coffee my husband is walking around with, but just a couple more days. Nevertheless, I am amazed at my control, and the lack of the crazy cravings that I had on Day 2 and 3. This is gluten free day and another challenge is to replace a meal with a smoothie. I am patting myself on my back since I have done this challenge everyday for the last 10 days! I started the day with lemon juice in hot water, followed by my favorite power smoothie, made with coconut milk, banana, strawberries, kiwi and hemp powder flavored with vanilla. Lunch was a tabbouleh and dolmas with a nice scoop of homemade hummus. A glass of freshly squeezed orange juice on the side. Snack was my favorite date nut balls with a glass of grapefruit juice. For dinner I had a bowl of brown rice with cauliflower curry and a bowl of avocado, cucumber and tomato salad flavored with a simple vinaigrette of freshly ground black pepper and himalayan pink salt, a teaspoon of olive oil, and a teaspoon of lime juice. My judgement on today: It was a great day, and I am in the groove with this detox thing. 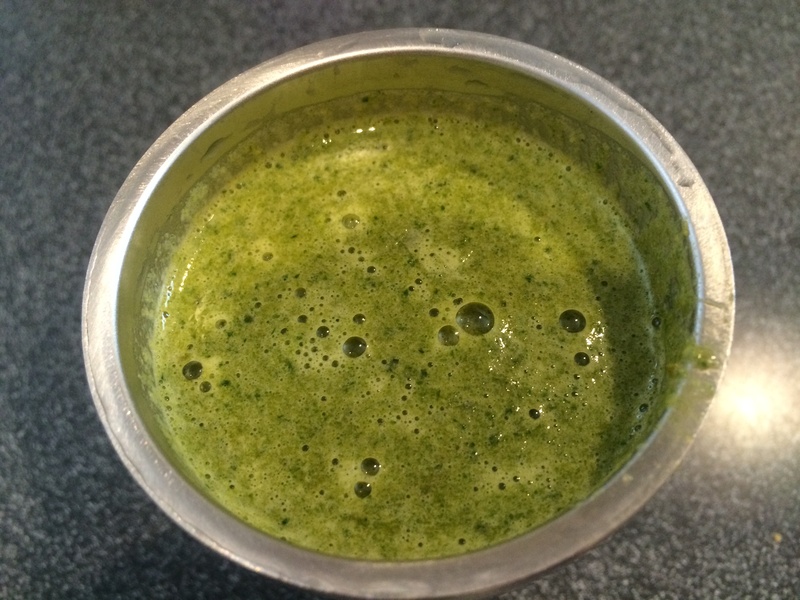 Last but one detox day today… Bittersweet feelings… I’ll tell you why in my final summary! My favorite breakfast smoothy, that I have not had in a while, was for breakfast today. For lunch I had 1 stuffed Paratha (flatbread stuffed with potatoes and spices). With a avocado salad and home made tomato chutney on the side. In the afternoon I munched on some raw nuts and had a glass of freshly squeezed tangerine juice. 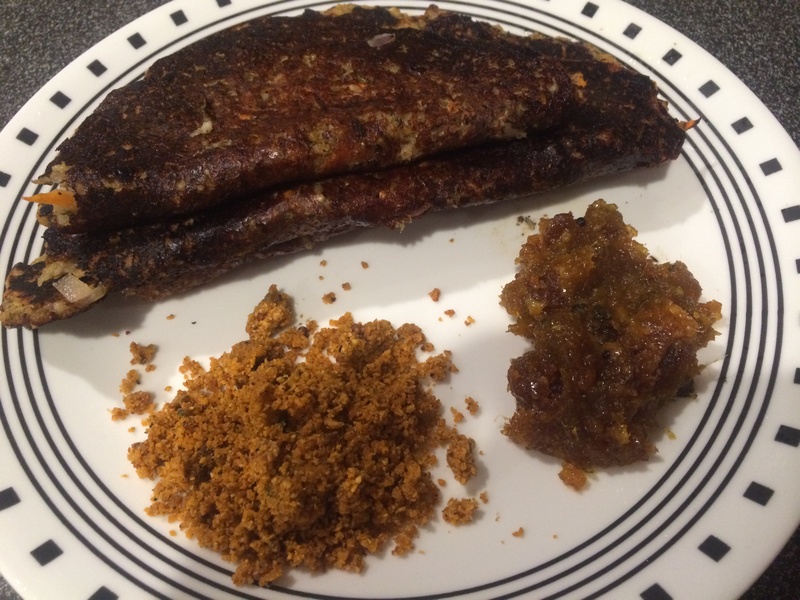 Dinner was Adai… A most wonderful and filling snack with a bowl of apples and pears for dessert. My judgement on today: Damn. I am becoming a pro at this. I need to visit my onilne detox mentor and give her a big hug!!! Or better still, maybe I should take her out to a juice bar! This was a tough day. Went to bed at midnight last night and woke up at 4am to get some work stuff done! This would’ve been an awesome coffee day, but I made do with hot water with lemon! I think i am actually going to miss it starting tomorrow. Maybe I will have it before I have my coffee, now that’s an idea! Smoothy was awesome. I used freshly squeezed orange juice and coconut milk as the base and blended in bananas, strawberries, and an overripe pear with a a couple of spoons of chia seeds and a spoon of flax meal for an extra boost. Coconut palm sugar was the sweetener. It was lovely! Lunch was a bowl of chopped vegetables (green peppers, radishes, carrots, purple cabbage), with a cup ofsteamed and salted peanuts topped with a tahini sauce, fresh coconut water and a bowl of papaya. Afternoon snack was a a couple of date nut balls. Dinner on this snowy day was a bowl of brown rice with pepper and tomato rasam topped with an avocado and sprouts, and a bowl of fresh cut papaya, apples and grapes. My judgement on today: To put it very simply, it was easy peasy…. I can’t believe I made it!!! 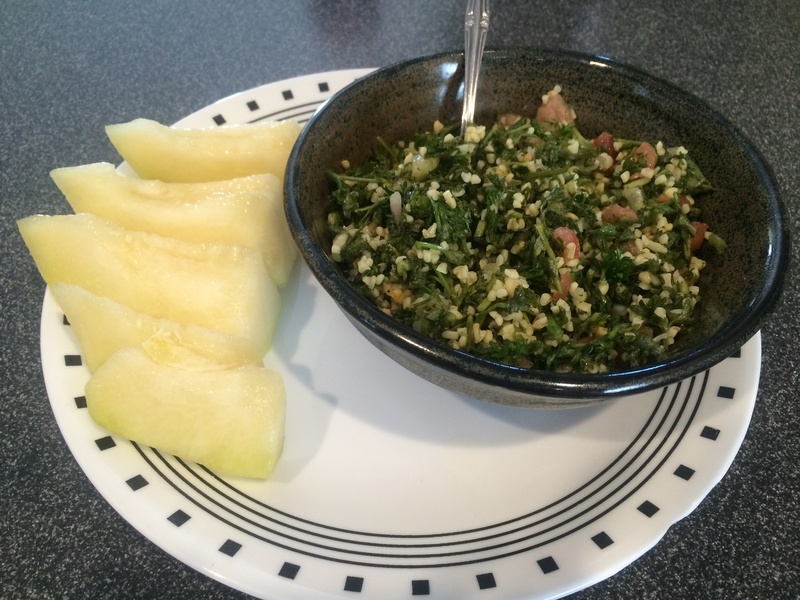 What I learnt from this detox…. Several friends and family have asked my if I checked my weight and why I did this detox. Did I have any health problems. My answer is NO. I just did this detox to challenge myself and see if I could do this. I did not have any other objective except to really detox and give my body a much needed ramp up. We all get so caught up in our lives and our hectic schedules, that we forget, our body is not a machine. It needs TLC, it needs a break from allthe processed foods, external chemicals and unpleasantness that it is subject to on a daily basis. Just as our mind needs a break periodically, so does our body! The hardest part of this detox for me was letting go of dairy and coffee and tea. However, half way through the detox program, I was able to transition very easily. I wish I had not had my coffee by mistake on Day One I might have transitioned earlier. I made sure I did all the extra challenges… However, I noticed that I was unconsciously substituting my breakfast each morning with a power packed smoothy and that was not at all difficult. In fact I have to confess that I am one of those people who skips meals often and almost never has a breakfast. So this smoothy was actually a bonus meal for me, one that I was skipping almost every day. Since I did not skip any meals during this detox my mood was a lot calmer, I was able to handle situations a lot better. Even before the detox, my family and I have been healthy eaters. 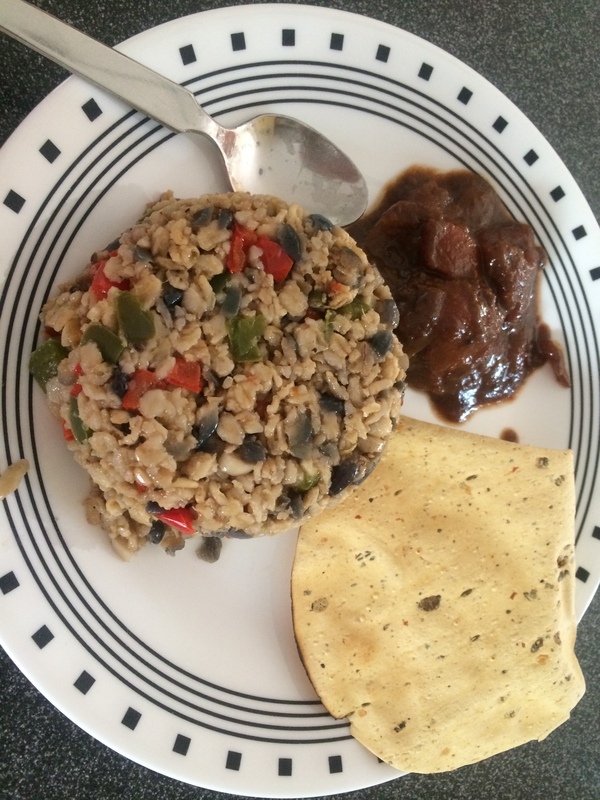 We used plenty of chia seeds and brown rice and quinoa, and fresh vegetables. I eat plenty of salads and we avoid rich and fatty foods. What this detox did for me is help me regulate the way I eat each meal and portion it appropriately with cooked foods and salads. I came up with creative ways to substitute white rice in dishes, as with oatmeal in the fried rice, and with quinoa in crepes. It was a wonderful learning experience, one that I will continue to develop, even though, coffee and dairy will find their way back in. I don’t think I have ever focussed on my self so much as I did in the last 10 days since my first kid was born 10 years ago. That’s why I will have bittersweet memories about this detox… Or will I? May if I continue to spend a little bit of time each day to take care of me, and what I eat that will be hugely beneficial to my family just as it will be to me. So maybe this does not have to be a bittersweet memory after all. Thats a total win-win.